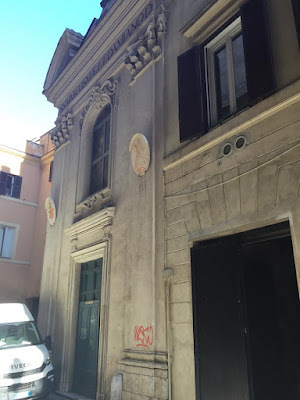 This little baroque church was built between 1722 and 1724 for the Confraternita dei Barbieri, a brotherhood of barbers who performed blood-lettings and surgery as well as trimming beards and cutting hair. The church has a single nave and the interior of the church is covered in stucco and gold leaf. In 2010 and after many years of restoration, the church was again reopened for mass and weddings. At the altar on the right is an oval tondo of the Madonna and Child attributed to one of the Zuccari brothers and in the left-side altar is a painting from 1594 of Santa Helena with the Cross attributed to Cristoforo Roncalli. The nave vault fresco by Giovanni Antonio Grecolini depicts the Apotheosis of Saints Cosmas and Damiano and there are two frescoes of the Lives of Saints Cosmas and Damiano by Michelangelo Cerruti.